iPhone users are fond of updating their devices to get the latest features on their phones. Every time an update appears on your phone, you are so eager to update your phone you do not take the time to understand what kind of update you are making. Some of these updates may make your device behave abnormally. Imagine if you went to make an update on your iPhone and your phone gets stuck showing the Apple logo, is frozen, or it cannot restart or etc. You may also be trying to jailbreak your iPhone and it gets stuck on recovery mode. It can get frustrating if you do not know what you are supposed to do to fix iOS to normal free. In this article, we look at some of the ways you can fix iOS to normal free and avoid some of the abnormal situations when you try to update your iOS device to the latest version. Part 2: Is There Any Truly Free Way to Fix iOS to Normal? iPhone shows the Apple logo. iPhone stuck on the blue/black/white/red screen of death. iPhone stuck in headphone mode. iPhone will not unlock or slide off. Apple offers to fix iOS to normal free to users whose iPhone’s are under the 1-year Apple warranty, AppleCare plan and customer law from the purchase date. This excludes any accidental damages, unauthorized modifications, services or disassembly. 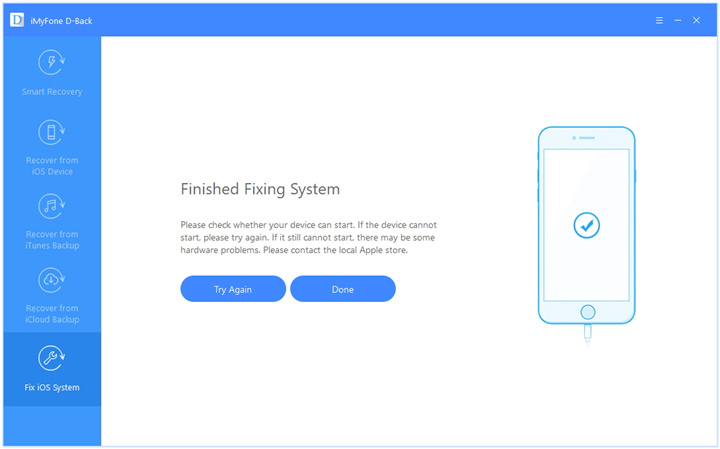 If your device does not have a warranty or it is expired, you can try some of the available software compatible with your device that has a free trial version that can help to fix iOS to normal free. There are many ways you can fix iOS to normal free using software. iMyFone D-Back is one of the best software you can use to fix your iOS issues on your iPhone. It can fix your iOS issues without losing any data from your phone. 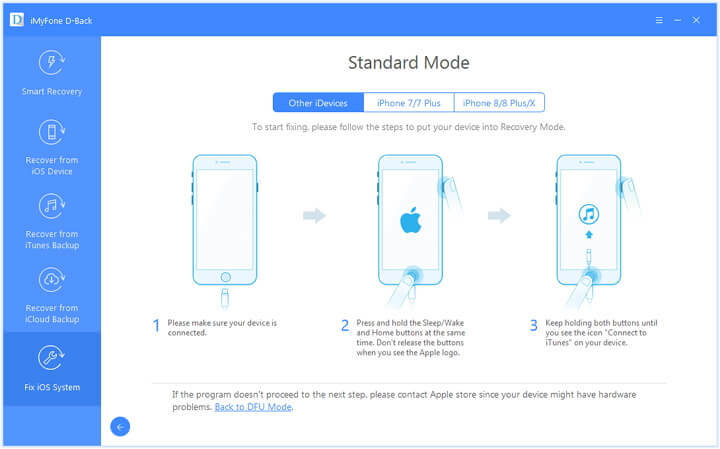 Step 1: Connect your device to D-Back then choose the Standard mode and the program will prompt you to enter your device to DFU or Recovery mode. Step 2: To put your device in DFU mode, click Start to start running the program. Press and hold the Sleep/Wake and Home buttons at the same time for 8-10 seconds. Release the Sleep/Wake button but keep holding the Home button for another 5 seconds. If the device does not enter DFU mode put it in Recovery mode. Press and hold the Sleep/Wake and Home buttons simultaneously. The Apple logo will appear but continue to hold till you see the Connect to iTunes icon appear. 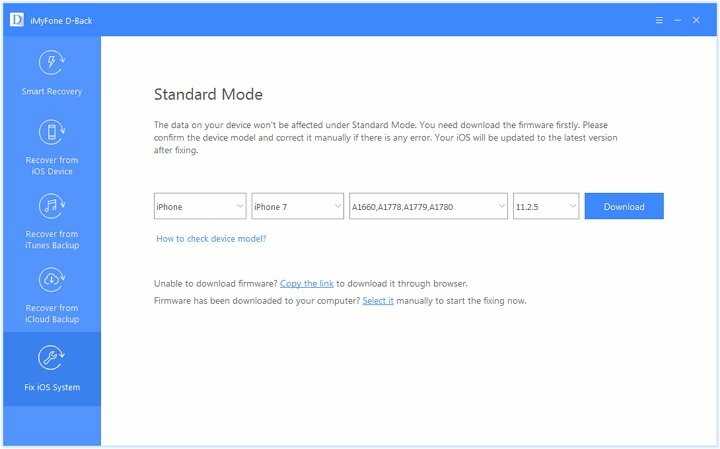 Step 3: Once on DFU or Recovery modes download the new firmware for your device. D-Back will detect your device automatically and provide you with the latest iOS version that suits your device. Click Download. If the program does not detect your device, you can manually select it and download the firmware. Step 4: Once the firmware is successfully downloaded, click Start to fix for the program to automatically start fixing your device. After the process is done, start your device. If it does not start retry again. 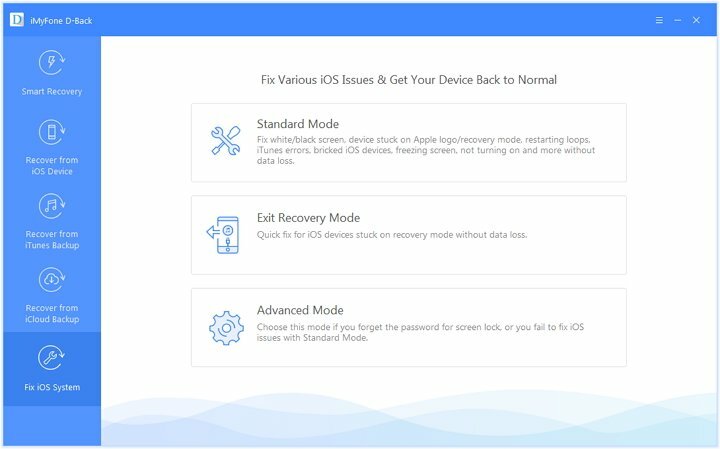 The Standard mode is a safe mode to use since it does not lose your data in the process but if it does not work you can use the Advanced mode to fix iOS to normal free on your iPhone if the Standard mode does not work. However, the advanced mode will erase all the data on your iPhone. If that does not work, you can visit the nearest Apple store to get your iPhone checked. Another thing to consider is that your device may have hardware problems that iMyFone D-Back cannot fix since it only fixes iOS system problems. Before you fix any iOS problems on your iPhone there are things you need to check for so that your device is well prepared to receive the updated app when you fix iOS to normal free. Make sure the app you are downloading to fix your iPhone is compatible. This way it can fix your iOS issued quickly. The app you are downloading on your iPhone needs to be the latest version of your iPhone. Your iPhone should have enough storage space to accommodate the update. This might mean deleting some data and files that you do not use or saving the apps that occupy a lot of space on your computer or iCloud. It is prudent to always back up your iPhone on iCloud, iTunes or your computer just in case you lose data in the process of updating your phone. Step 1: Get your device connected to a Wi-Fi network. Step 2: Click on Settings then tap on iCloud. Step 3: Click on Back up. If it is not already turned on turn it on. Step 4: Click on Back up now. Step 5: Check your backup by clicking on Settings -> iCloud -> storage -> manage storage, and then select your device. It is advisable to always have a backup of your device whether it is on iTunes, iCloud or on your PC. You can also make a quick and partial backup of your device’s data using iMyFone iTransor. iMyFone iTransor is iOS software that is used to backup and restore data selectively from iTunes or iCloud backups on your device without losing any data. It backs up and restores data only from your device’s contacts, SMS, Whatsapp and WeChat from iTunes or iCloud backups. iPhone devices will at times have iOS problems when trying to jailbreak your device or update it. Use the above simple ways to fix iOS to normal free and see if it will work for you. The most important thing to remember is to always back up your device before doing any repairs on the device. You can back up on your computer, iCloud, or iTunes just to be on the safe side. In case your iPhone develops some of these abnormal issues, you can try some of the ways mentioned to see if they help in fixing the iOS problem. Also feel free to leave your comments below.